The conservation status of the American Oystercatcher (Haematopus palliatus palliatus) has received much attention in recent years. The American Oystercatcher is inherently intolerant to excessive levels of disturbance, has a small population size and a very restricted year-round range. These characteristics make the species particularly vulnerable to issues affecting all coastal shorebird species, such as habitat loss and alteration due to increasing development and recreation, pollution, human disturbance and expanding predator populations. Prior to the early 1980s, there was relatively little information in the literature regarding American Oystercatchers. Moreover, prior to the work presented here, information on the status and reproductive biology of oystercatchers in Virginia was lacking. The objectives of this study were to examine the status, distribution and reproductive rates of American Oystercatchers in Virginia and provide much needed information to guide conservation and management efforts. A comprehensive survey of breeding American Oystercatchers in coastal Virginia during the 2003 breeding season more than doubled previous estimates for the state and suggests that Virginia supports the largest number of breeding oystercatchers (588 pairs) on the Atlantic coast. 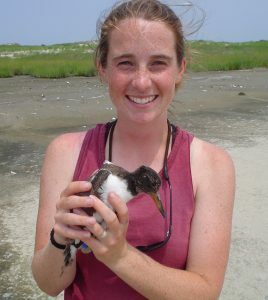 Reproductive rates of American Oystercatchers breeding on barrier islands in Virginia were investigated between 2002 and 2006. Overall annual productivity estimates for pairs breeding in this system were well above what has been reported for this species in other parts of its breeding range and may be attributed to the conservation status of Virginia’s barrier islands and to ongoing mammalian predator management efforts. Given the comparatively high reproductive rates reported here, it seems possible that some of the barrier islands in Virginia may serve as important population sources for the American Oystercatcher. The American Oystercatcher will continue to be a focus of research interest, not only because of fundamental information gaps about the species’ biology, but also because of concern for the species’ conservation status range-wide and its potential to serve as a bioindicator our coastal ecosystems.